Kids know more about life than we acknowledge. Before computers and i-phones they read Dr. Seuss and were looked upon as innocent about real life. It seems now that adults are more ready to talk to children as though they were adults and not too cautious about what they let the little ones see. This point is made in Ása Helga Hjörleifsdóttir’s freshman full-length feature which stars the adorable Gríma Valsdóttir as a nine-year-old who is bright, curious, and a veritable sponge, picking up new things that she learns every day and trying to parse the emotions on display from a group of farmers in rural Iceland. These farmers are not the happy workers depicted in kids’ picture-books—the ones that are mistakenly given to urban youngsters who cannot relate to any of the nonsense. Nobody here resembles “Heidi’s Farm Friends,” “Mrs. Wishy-Washa’s Farm,” “Down by the Farm,” and “Jigaree.” Collegian daughter Ásta, just back from college in Reykjavik, is morose, as her boyfriend ditched her for another. She complains to her parents that they are using medieval techniques to milk the cows and will be crushed by the big guys. For his part Jón, who writes for therapy as he confesses that his life has been a mess, takes advantage of Ásta’s misery with a one-night stand that is witnessed by Sól. He feels a kinship with the child who he believes could herself become a writer. 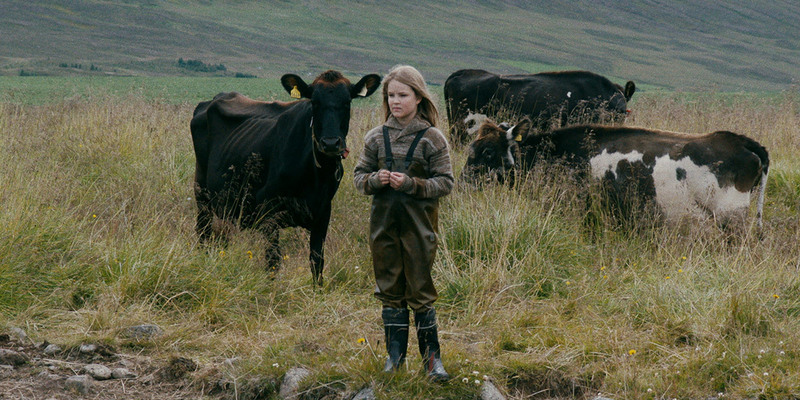 Sol helps deliver a calf, shown in full detail by German cinematographer Martin Neumeyer, but even that happy event becomes a source of more misery for Sol when the calf is slaughtered despite being treated as a pet by the child. The fairy-tale nature of the tale is climaxed when Sól goes to the lake in the mountains where a swan, a monster by myth, is said to lure people to their deaths. She is determined to face up to the handsome creature, given emotional fortitude by her summer’s life with this melancholy family, which gives her resolve never to depend on people again because they are at least as fragile and vulnerable as she feels. Sól captures the director’s interest, the girl appearing in most frames with a look of curiosity to the strange people surrounding her, obviously learning more about both physical nature and human nature than she could from a schoolbook. The actress, whose real age is not revealed by internet sources like the IMDB, has a remarkable debut and can expect other offers to follow. The film as a whole, which was shown at the Scandinavian Film Festival, is slow moving and mostly evenly pitched. The relationship of the girl to the summer worker, which appears to be headed into pervert territory as he wraps his arms around her at bedtime, is innocent enough in a picture that is a pleasure to watch, a coming of age story that in fact reveals changes in outlook not only of Sól but of the summer farmhand and the family college girl as well.